Notice how the expectation (or average) bond length, rexp is no longer the same for all energy levels. 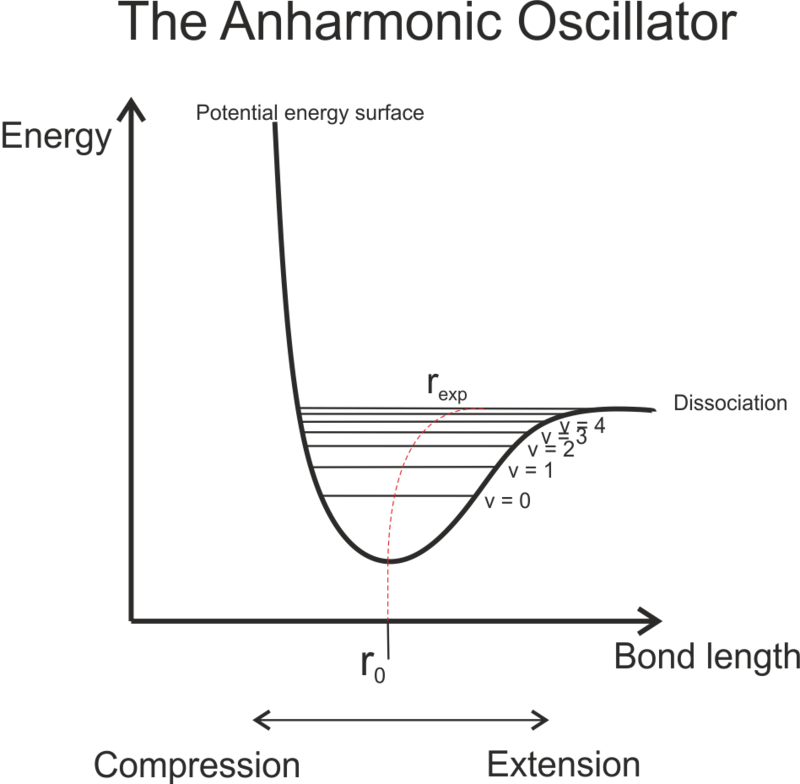 One effect of the anharmonicity is this deformation as the energy of the vibrations increases. Another is that now, the vibrational energy levels are no longer equally spaced, but instead get closer together as the vibrational quantum number increases. 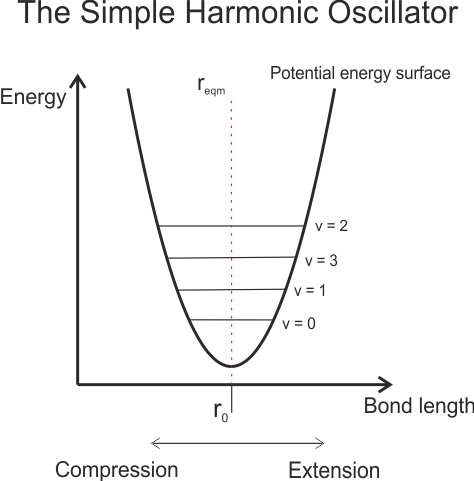 This model also illustrates that there aren't an infinite number of vibrational energy levels - above some energy, the bond breaks and the molecule dissociates. Vibrational energies occur roughly in the 100 - 4000 cm-1 (about 1 - 50 kJ mol-1), or infra-red (IR) region of the electromagnetic spectrum. 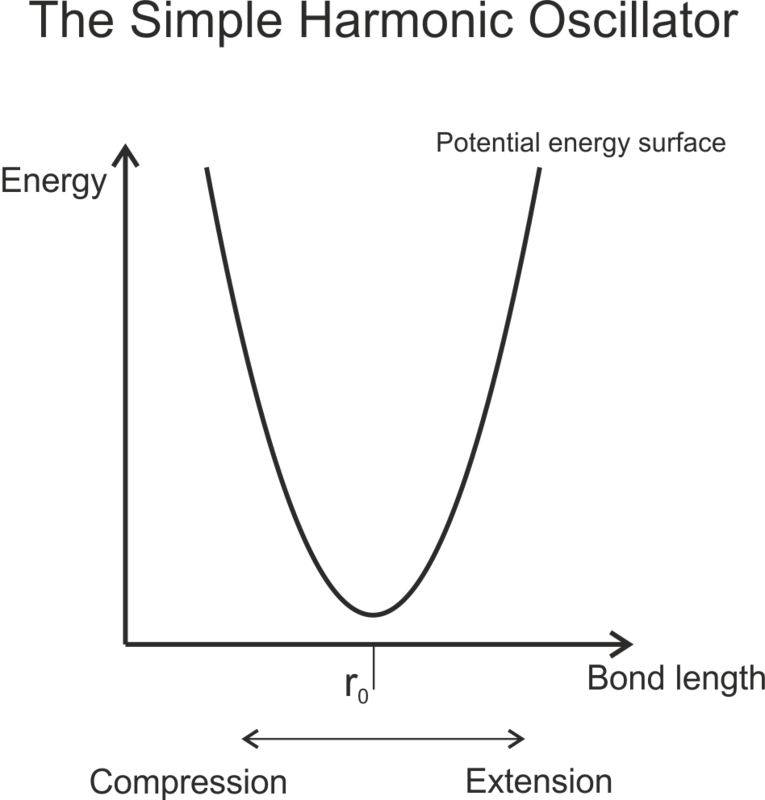 The fundamental principle for obtaining a vibrational spectra is that the electric dipole moment of the molecule must change during the vibration. If there is no change in dipole moment, then this particular vibration will not give rise to any absorption in the IR region. An example of this can be seen below for the symmetric stretch (Σg+) mode of carbon dioxide. 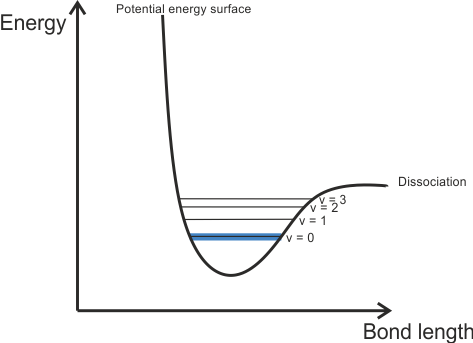 Because both C=O bond lengths change exactly in phase, there is never a net dipole moment on the molecule. A homonuclear diatomic molecule such as dioxygen (O2) has zero dipole moment, so it has no IR spectrum. The number of modes (types) of vibration can be predicted for a molecule, containing N atoms, using the following general expressions. Note: Please select the desired vibrational mode of the molecule from the drop-down menu below. After choosing a molecule, please select an energy level again to view the vibration.